Alexander “Sasha” Rakhlin works at the intersection of statistics, machine learning, and optimization. A major thrust of his research is in developing theoretical and algorithmic tools for online prediction, a method of machine learning that processes information provided in a sequential fashion. Rakhlin has uncovered critical connections between online prediction, optimization, and probability; these insights led to a fundamental theoretical understanding of the field as well as new efficient and accurate prediction methods. His contributions also include advances in statistical inference in structured problems, as well as new tools for optimal model selection. 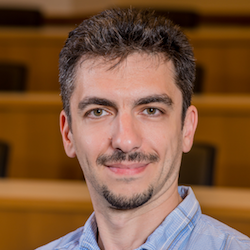 In newer lines of inquiry, Rakhlin developed a detailed analysis of statistical complexity of neural networks, offering insight into recent advances in deep learning. Rakhlin received a BA in computer science and a BA in mathematics from Cornell University in 2000 and a PhD from MIT in 2006 under the direction of Tomaso Poggio. Following an appointment as a postdoc at the University of California at Berkeley, Rakhlin joined the faculty as an assistant professor at the University of Pennsylvania in 2009 with an appointment in the Department of Statistics at the Wharton School, and was promoted to associate professor with tenure in 2015. After spending a year as a visiting professor in the MIT Statistics and Data Science Center, Rakhlin joins the Department of Brain and Cognitive Sciences as an associate professor with tenure as well as the Institute for Data, Systems, and Society as a core faculty member.